When I was little my mother read me the incredible story of a Belgian man who took the name “Damien” and dedicated his life to addressing injustice, introducing charity and working with lepers in Hawaii. My mom read to me about how leprosy was introduced to the islands of Hawaii from outside influences. The Hawaiian government, to deal with this disease, would rip those found with leprosy from their families and banish the lepers to the secluded island of Molokai. The sailors would drop the lepers over the side of the boat, telling them to swim to shore; the sailors felt that the stronger beings would live and the weaker were going to die anyway so, the sailors didn’t care. My mom read that, upon Molokai, the people who were treated without dignity forgot to treat themselves with dignity as well. And so, the stronger lepers would steal from the weaker, drunkenness and debauchery abounded, and lepers closer to death would be left along the road where wild animals would sometimes come and eat them before they had even died. (The stories of faith are not safe stories). Molokai was supposed to be secluded, but whispers of the injustices began to reach the other islands. Fr. Damien was around when a priest visited Molokai and returned; the priest who had visited Molokai was so shaken all he could do was sit in the chapel and cry. Eventually the bishop asked if some of the priests would establish a rotation system and visit the island for a few weeks at a time so that the leper colony could have access to the sacraments and prayers. Fr. Damien, originally from Belgium but serving in Hawaii, was the first to volunteer. This should be a long story, a chapter-book, like the kind my mom read to me on our long couch in the living room. But, this is not that medium. Fr. Damien arrived and started rebuilding the church…and then coffins for the lepers who passed away. The lepers on the island doubted his dedication at first. They coughed on him as he passed…some even threw infected things at him, like fingers dismembered because of the disease. But, he took this in stride–even going so far as to share his meals and pipe with the people of the island. He built relationships as well as buildings. And then he built a better hospital and an orphanage. He wrote to newspapers explaining the plight of the island which infuriated the exposed government. His drive and commitment angered the government and the Board of Health who were supposed to be helping Molokai. They gave him an ultimatum: stay on the island if you want; but you can never come back to society if you stay. And so, he stayed. He never saw his family again. He was forced to shout his confession to the bishop from his little rowboat to the boat the bishop came on–with all the sailors in earshot. He buried the people who became his friends on the islands as they succumbed to the disease. He transformed the island into a community. And then, he contracted the disease as well. At the time, people didn't know what caused leprosy and some speculations said it was sexually transmitted–so he was accused of that (we now know leprosy is not transmitted sexually, btw). So, that’s the story. There was a man who dedicated his life to making the world more fraternal…and eventually, he died. After his death he was praised as a hero; there is even a statue that values his work in the U.S. Capitol building. But, that does little for him now, doesn’t it? This is the reading-couch, but I was older than this when my mom read about St. Damien. There was an epilogue at the end of the book which I remember reading while sprawling over the arm of the couch. It said that Fr. Damien was declared a blessed in 1995. I remember counting the years from his death (1889) until his beatification (1995): 106 years. I added 106 years to 1995, and concluded that I would need to live very long if I wanted to see his canonization. I recall asking my mother how old Mrs. Majewski, our next door neighbor, was so I could gauge how old adults actually were. I remember being disappointed that I might never see the then-Blessed Damien of Molokai’s feast day. But, I was glad I knew his story and hoped I could see him in heaven one day. But, he wasn’t obscure, he was an old friend. Now, a few months earlier we had received a new Archbishop, a man who had previously been connected to California. In the days that followed I learned that some of St. Damien of Molokai’s relics were going to come to the United States (North America). They would stop in California…and Michigan. What are the odds? I remember I left class that day and headed to the Cathedral. One of the men at the door said I would have an opportunity to walk past the relics and asked if I had brought anything to be blessed. But, I hadn’t. So I just walked to the front and prayed. And then I found a spot in the front row (by a group of religious sisters) so I sat there and celebrated mass with some faithful from Detroit and visitors from Hawaii…and St. Damien of Molokai. I don’t even think I took a picture. This seems odd. Only, sometimes when I get together with those whom I love the most, I don’t take pictures. That’s because pictures distract and take time and when you’re with someone who you love you’d rather not interrupt the time. Sometimes still I think about the day I lay stretched over the arm of the sofa, adding years and seeing if St. Damien would be canonized in my lifetime. He was! And, by the love of all things holy, I who live hundreds of miles away in one State of fifty was able to encounter St. Damien of Molokai down the road from my house. As the mass that day drew to a close, a Hawaiian woman dressed in folded, traditional fabric and a headdress of greenery walked to the front of the church and sang a heartfelt, touching rendition of “Aloha Oe” to us, the faithful of Michigan. I think that, in some ways, that song was the best song that could have been sung. 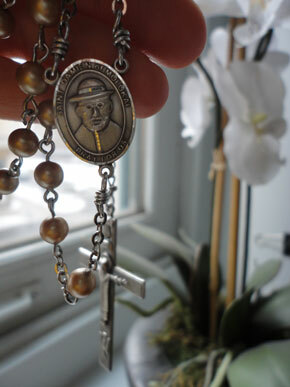 St. Damien, my rough and dedicated friend…I hope to one day see you in heaven. We shall eat waffles (maybe, in heaven, I will no longer be gluten-free–I doubt that you still have leprosy) and pineapple and talk about suffering and joy…those two perpetual friends. (I’ve been one of your biggest fans; thanks for inspiring my life). Scary to think of what kind of stories your Mom read to you!